Although New Street is now called New Row and seems a quiet backwater, that was not always the case. It received its new name only in 1937 and once upon a time it was one of the more important streets leading to Covent Garden (more on the history of the street here). The shop occupied by Moseley & Son can still be admired. If you compare the Street View vignette with the situation now, you will see that the outside is more or less the same as it was in 1839; the windows and doors are still where they were then and the two corbels on either side of the fascia board and gutter look old enough to be original. But what clinches the matter is the skylight that can be found inside the shop. 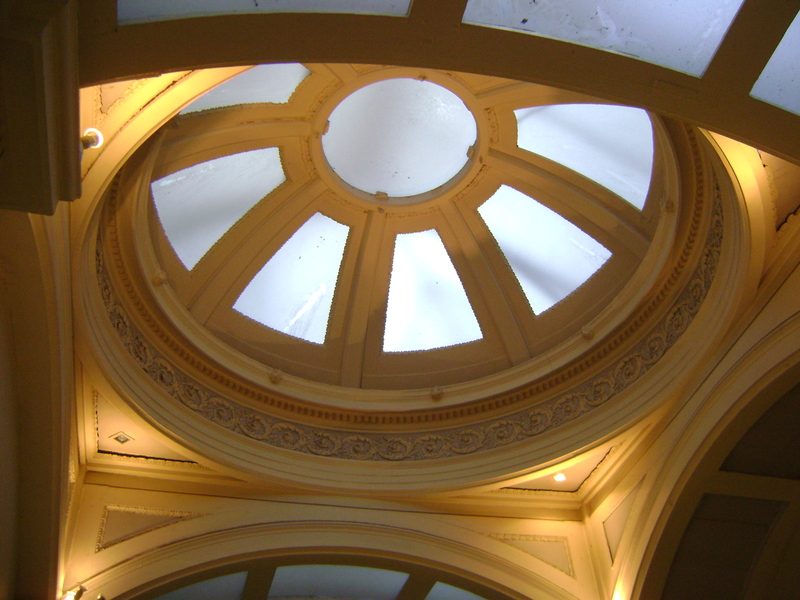 On a trade card for the Moseleys, the round structure in the centre of the ceiling can clearly be seen, although it does not seem to let much light through. Nowadays, however, it certainly brightens up the interior. In earlier records (before 1834), the firm is listed at number 16 New Street, but I am not sure that they moved. Perhaps it was just a case of renumbering, something the Victorians seem to have been quite fond of. Which John Moseley gave his name to the shop is unclear. 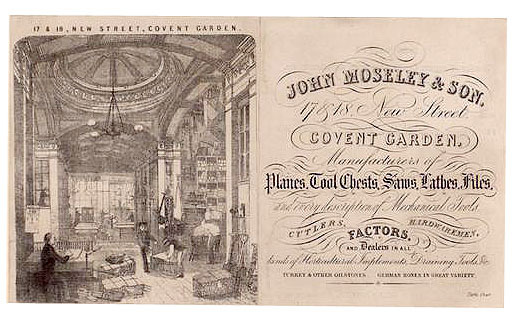 According to an 1862 advertisement (see below), the shop had been established in New Street in 1730, but I have not been able to find out whether that was by a John Moseley. There was certainly a John Moseley in charge in the early 19th century. 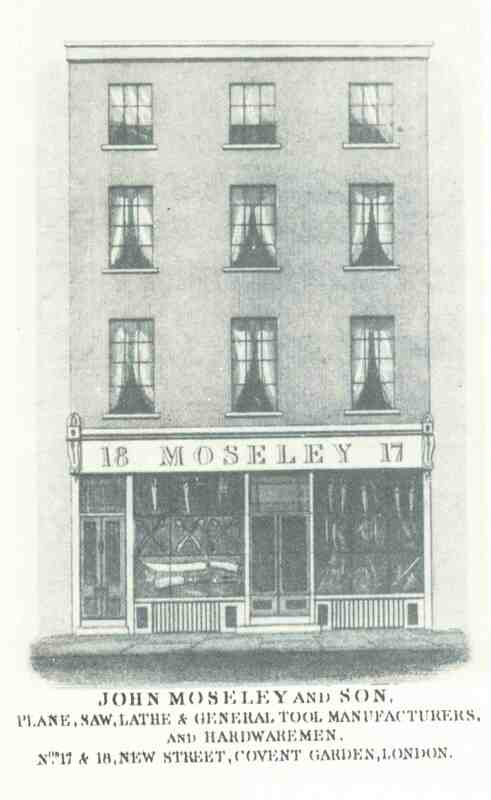 For instance, an 1810 record with the Sun Insurance Office lists John Moseley of 16 New Street, plane maker. 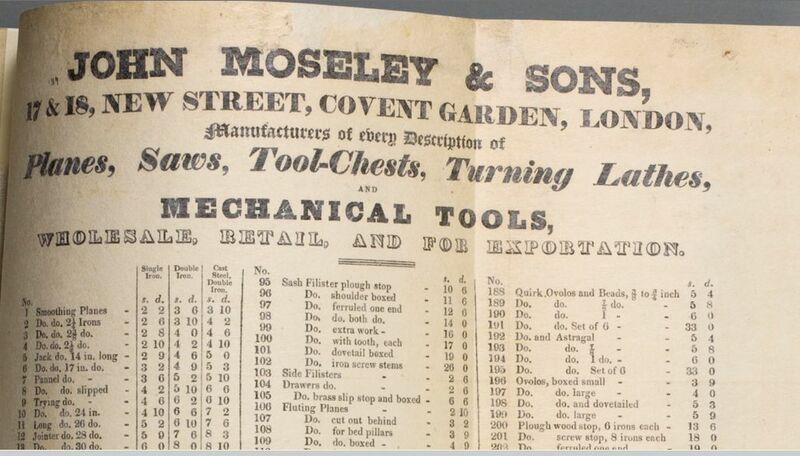 “The Sun insurance records show that John Moseley was the possessor of a horse mill in the yard of his premises, which means that some kind of manufacturing was taking place, as the mill would have provided power to run a saw or perhaps a grinding wheel”(1), so he did not just sell tools, he made them as well. In the 1841 and 1851 census records, we just find William in New Street, but in 1861 both William and Richard are listed there as toolmakers. That Richard was staying overnight at New Street was probably just accidental as in 1851 and 1871, we find him with his wife Jane and children in Clapham and Lambeth respectively. 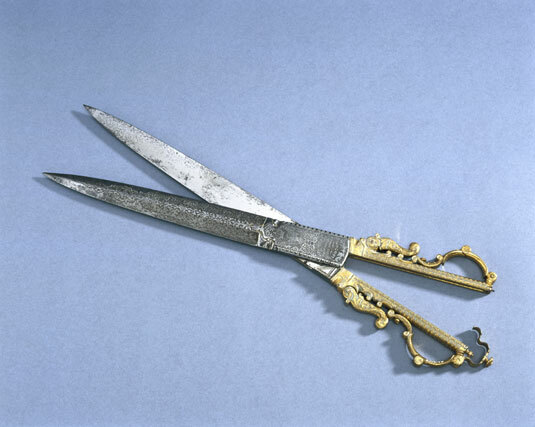 (4) In 1851 Richard is listed as “assistant clerk cutlery warehouse” and in 1871 as “retired plane maker and cutler”. Although the actual place of work is not stated, one may assume he worked in the family business. 1862 is a year full of changes for the firm. In that year, William had a new property built at 27 Bedford Street. 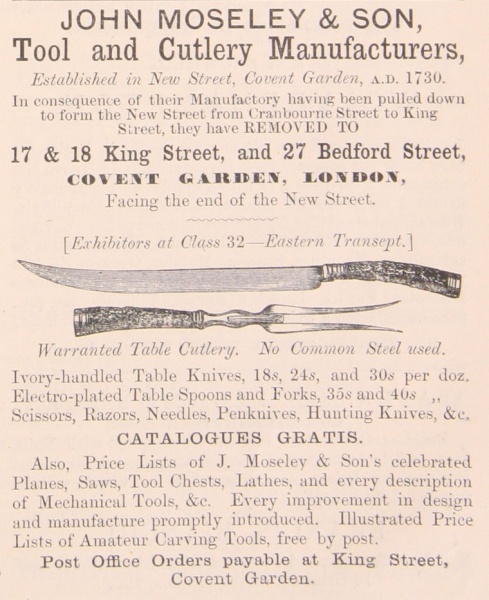 In the catalogue for the 1862 International Exhibition, 54 Broad Street (later 54-55 Broad Street) is listed for the first time, which may very well coincide with the split of the business into a retail and a wholesale branch. Around the same time they must have moved from New Street to 17 & 18 King Street because “their manufactury having been pulled down to form the New Street from Cranbourne Street to King Street”. Not quite sure what road scheme they are talking about here as whatever property was pulled down, it was not 17-18 New Street as that is still there. 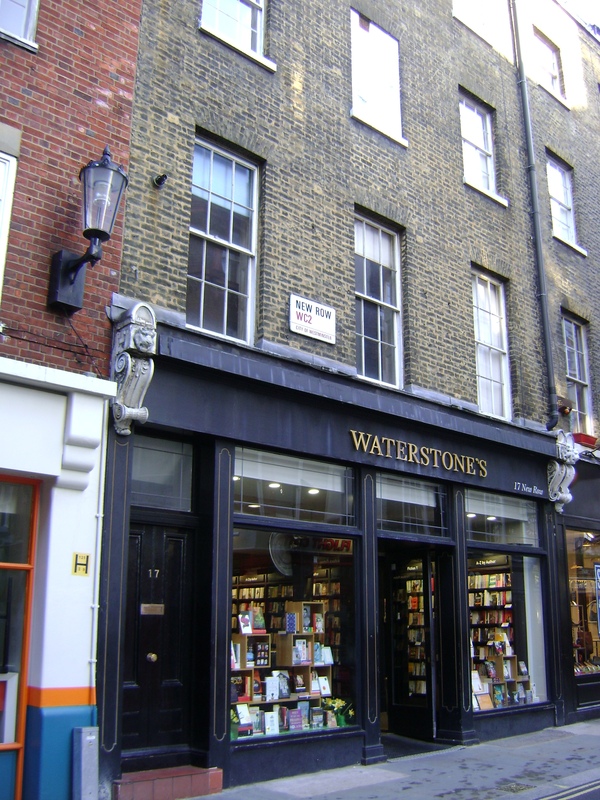 A bit of reshuffling must have gone on, as around the same time, Joseph Lilly, bookseller can be found at 17 & 18 New Street, whereas Tallis mentions him at number 19. I will try and find out some more information about the building work and the relocations. (1) Guildhall Library Manuscript Section, Electronic Newsletter, issue 10, winter 2007/8, online here. (2) National Archives, Kew: PROB 11/1742/138. 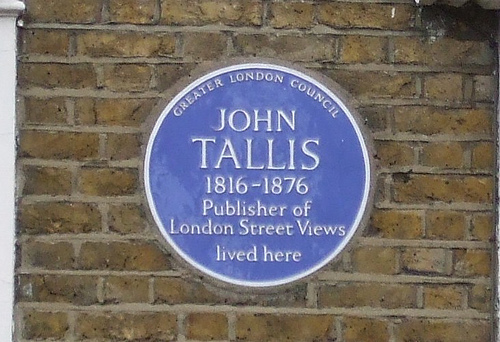 (3) John, born 31 Jan. 1796, baptised 13 Feb. 1797 at the Independent Chapel in Fetter Lane; Thomas, born 12 April 1806, baptised 4 July 1806 at the Independent Chapel in Bull Lane, Stepney; William, born 17 March 1808, baptised 3 Aug. 1809 at the Presbyterian Chapel at the Presbyterian Bow Meeting, Exeter; and Richard, born 7 April 1812, baptised 17 Nov. 1812 also at Bow Meeting, Exeter. (4) Jane Brook and Richard Moseley married in 1833 at Wakefield, Yorkshire. Some of their children were born in that county, so I assume Richard worked there for quite some time before coming back to London, although I have not found the 1841 census record for the family to substantiate this. 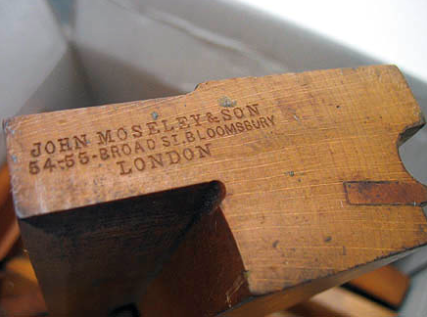 In 1861, Walker Moseley, the eldest son who also worked in the cutlery business, was the head of the household at 13 Union Grove, Clapham, providing a home for four sisters and three brothers. Where their mother Jane was at that time is uncertain. (5) England & Wales, National Probate Calendar (Index of Wills and Administrations), 1865. (7) The London Gazette, 9 August 1867.